Coffee (Coffea L.) is the world’s favorite beverage and the second-most traded global commodity after oil. In 2009/10 coffee accounted for exports worth an estimated US$ 15.4 billion, when some 93.4 million bags were shipped, with total coffee sector employment estimated at about 26 million people in 52 producing countries. Arabica coffee (Coffea arabica L.) and robusta coffee (C. canephora Pierre ex A.Froehner) are the two main species used in the production of coffee, although the former is by far the most significant, providing approximately 70% of commercial production. The productivity (green bean yield) of Arabica is tightly linked to climatic variability. The United States is currently the world’s largest market for coffee. Global annual consumption per capita is 4-5 kg on average. An estimated 1.6 billion cups of coffee are drunk worldwide every day. Coffee producers in Africa accounted for about 12% of global supply and less than 11% of global exports of the product for the 2009/10 season. The coffee plant or tree is a woody perennial. Coffee beans are the seeds of the coffee plant which are found inside the coffee berry or cherries. The coffee beans are processed and brewed into the coffee we drink. 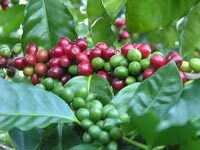 As with most crops, coffee is beset with pest and disease problems such as the coffee berry borer, coffee berry disease, white coffee stem borer, coffee wilt disease, parasitic nematodes, root mealy bug, green scales, leaf rust, and brown eye spot. Some can be very serious and can have a major impact not only on individual farmers but on the economy of countries or regions heavily dependent on coffee for foreign exchange earnings. Coffee production is labor intensive from planting to harvesting. It takes four years for a coffee plant to yield fruit and five to six years to produce optimal yields. Of the two main types of coffee, arabica has a milder taste and tends to be more expensive, while the higher yielding robusta is widely used in instant coffee and in stronger roasts. Coffee is a tropical plant but robusta can be grown at sea level, and arabica does best at higher altitudes and is typically grown in highland areas. Around 125 million people worldwide depend on coffee for their livelihoods. The volatility of coffee markets in combination with poor production infrastructure and services have put the majority of coffee producers in developing countries in low-input-low-output cycles and structural poverty. This combined with growing demands for healthier and more socially and environmentally friendly produced coffee in larger consumer countries has led to the certification of cooperatives worldwide. Agricultural research and development is needed to increase quantity and supply. There is a disparity between coffee producing countries and coffee consuming countries. Demand for coffee including specialty coffee is outstripping supply. Very little research has been done to produce quality coffee or protect the coffee supply chain from economic, climatic, or pest and disease threats. Climate change has wiped out millions of coffee trees. Colder nights, hotter days and unpredictable rains combined with more pests and disease are affecting many smallholder farmers. Scientists have found that an increase of 1° C can lead to a yield loss of almost 100 kg/ha or 20% of current yield. Growing coffee and banana together not only generates more income for smallholder farmers compared to growing either crop alone, it can also help coffee production to cope with the effects of climate change.